Behavior - Lens Studio by Snap Inc. The Behavior helper script allows you to create simple interactions without writing any custom script. With Behavior, interactions are completely configured in the Inspector panel. It allows you to configure the trigger type which defines when something should happen. Next, it allows you to configure what should happen as a response to a trigger. The selectable responses include a number of commonly used interactions like playing an animation, playing a sound, enabling an object and more. In the below example, I've configured the Trigger to Mouth Opened. Next, I've configured the Response to Play Sound. The resulting interaction is - when the user opens their mouth -> play a sound. To add the Behavior helper script, in the Objects panel select Add New -> Helper Scripts -> Behavior. This will create a new object with the Behavior helper script added to it. If you're looking for the Legacy Behavior helper script, you can download it here. Keep in mind that this version of the Lens Studio Behavior helper script is no longer officially supported. It's highly recommended that you follow the instructions above to add the Behavior helper script to your project. Once the Behavior helper script is added, it can be configured in the Inspector panel. To do this, first select the object in the Objects panel. Then, in the Inspector panel you'll see a number of options. To configure the Behavior helper script, first select the Trigger which defines when something should happen. Then, select the Response Type, which defines what should happen on trigger. Finally, configure additional settings based on the selected Trigger and Response Type. These additional settings are detailed below in the Trigger Types and Response Types sections. In the example below, we first set the Trigger to the Face Event type: Brows Raised. Then, we set the Response Type to Play Sound. 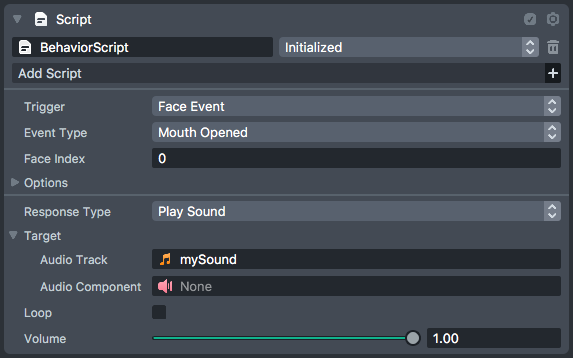 Finally, we configure the sound we want to play in the response type's settings. The resulting interaction is - when the user's eyebrows are raised -> play a sound. 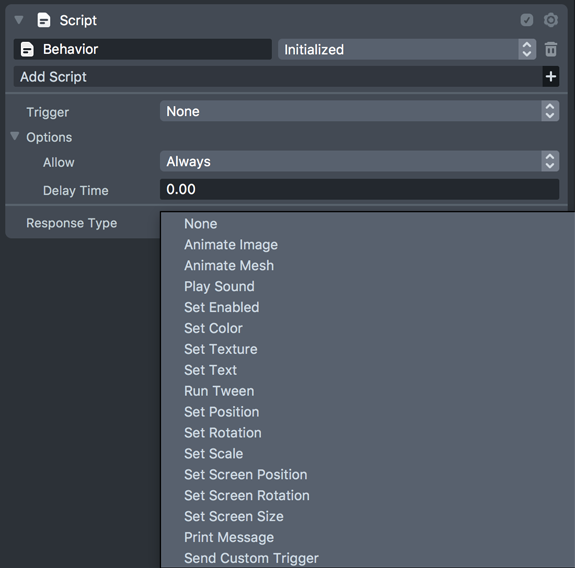 The Behavior helper script offers a number of Trigger Types via the Trigger dropdown. When the Trigger happens, the Behavior helper script will fire the Response. The sections below detail the available Trigger Types. 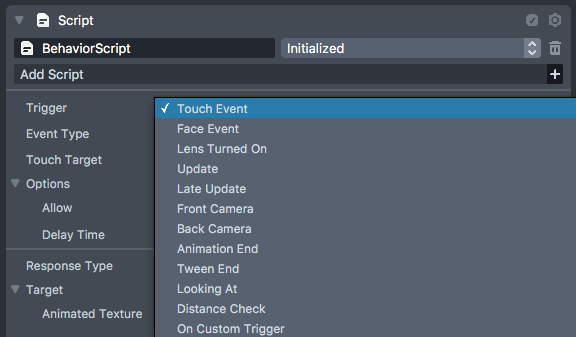 The Touch Event trigger responds to the user touching the screen or a portion of the screen. The Face Event trigger responds to the user moving their face in some way. The Lens Turned On trigger happens as soon as the Lens starts. The Update trigger happens every single frame. You can utilize the Update trigger and configure the Trigger Options to After Interval. This will create a trigger that happens every X number of seconds. The Late Update trigger happens every single frame. The Late Update however always happens immediately after the Update trigger. The Front Camera trigger happens every time the user switches to the Front camera either through the swap camera button or by double tapping the screen. The Back Camera trigger happens every time the user switches to the Back camera either through the swap camera button or by double tapping the screen. The Animation End trigger happens when a specified animation finishes. The Tween End trigger happens when a Tween finishes utilizing the Tween System. The Looking At trigger happens when one object is looking at another object. The Distance Check trigger happens when one object is within a configurable distance of another object. The On Custom Trigger happens when a custom trigger is fired via another Behavior helper script. See the Send Custom Trigger response type below. The None trigger is when you don't want the behavior to be run. You might use this when keeping old behaviors in your project as reference but don't want them to ever run. A number of additional options are available when configuring your Trigger that apply to all Trigger Types. When Always is selected, the Trigger will always happen over multiple same triggers. Additionally, you're able to configure a Delay Time which delays the Response a configurable number of seconds after the trigger happens. When Once is selected, the Trigger will only happen once during the lifetime of the Lens. Same triggers after the first will be ignored. Additionally, you're able to configure a Delay Time which delays the Response a configurable number of seconds after the trigger happens. When After Interval is selected, the Trigger will wait the Interval Time before allowing the trigger to happen again. Within the Interval Time window, same triggers will be ignored. When the Interval Time window is complete, the Trigger can happen again. Additionally, you're able to configure a Delay Time which delays the Response a configurable number of seconds after the trigger happens. The Behavior helper script offers a number of Response Types via the Response Type dropdown. When the Trigger happens, the Behavior helper script will fire the Response. The sections below detail the available Response Types. The Animate Image response type plays a 2D animation. The Animate Mesh response type plays a mesh animation. The Play Sound response type plays a sound. The Set Enabled response type enables or disables a Scene Object. The Set Color response type sets the color of an object or material. The Set Texture response type sets the texture of an object. The Set Text response type sets the text of a Text or Screen Text object. The Run Tween response type runs a Tween utilizing the Tween System. The Set Position response type sets the position of an object's Transform. The Set Rotation response type sets the rotation of an object's Transform. The Set Scale response type sets the scale of an object's Transform. The Set Screen Position response type sets the position of an object with a Screen Transform. For example, a Screen Image or Screen Text object. The Set Screen Rotation response type sets the rotation of an object with a Screen Transform. For example, a Screen Image or Screen Text object. The Set Screen Size response type sets the size of an object with a Screen Transform. For example, a Screen Image or Screen Text object. The Print Message response type prints a debug message to the Logger panel. 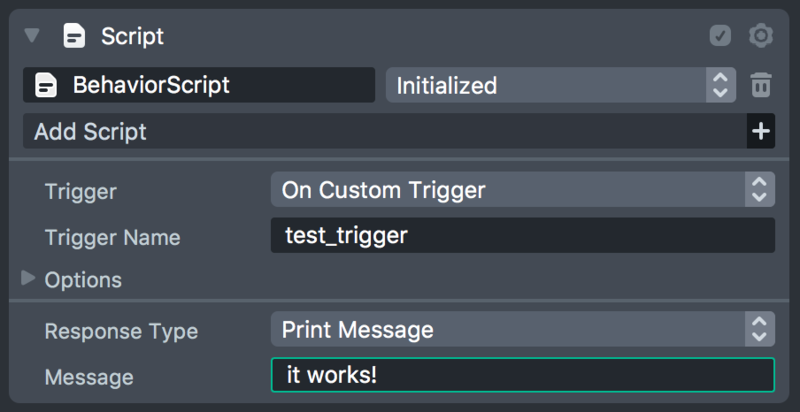 The Send Custom Trigger response type sends a custom trigger message as a trigger to other Behavior helper scripts. The On Custom Trigger type can trigger based on the Send Custom Trigger response type. In addition to configuring BehaviorScripts through the Inspector panel, it's also possible to interact with them through script. This means you can use your scripts to trigger BehaviorScript responses, or react to BehaviorScript triggers with your scripts. These functions are accessible on the api object of any ScriptComponent holding a BehaviorScript. They only affect the specific BehaviorScript being accessed. These functions are accessible on the global.scBehaviorSystem object from anywhere in script. They provide a way to globally send Custom Triggers or react to global Custom Triggers through script. In this example, executing the line of code will trigger the Print Message response on the BehaviorScript. In this example, touching the screen will cause the BehaviorScript to send a Custom Trigger which is reacted to by a function in script. 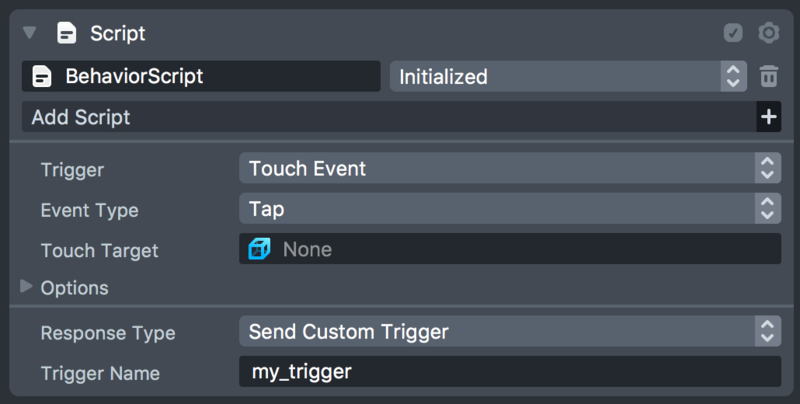 // Add our onTrigger() function as a response to the custom trigger "my_trigger"